The first song from much-awaited The Villain has hit the internet with a bang. The music of the movie is composed by Arjun Janya. The first song from Shivaraj Kumar and Kiccha Sudeep's The Villain has been unveiled on Saturday, July 14, at 10 am. The music of the much-awaited movie is composed by Arjun Janya. Shankar Mahadevan has sung the song titled 'I am Villain.' Director Prem himself has penned the lyrics for the track. It is a mass song praising the hero with negative shades. Prem has choosen simple words, like always, to reach out to the mass with the number. The song does not give away whether it will be shot on Sudeep or Shivaraj Kumar. The makers have used the visuals from the shooting for the song, which registered over 30,000 hits in a matter of 20 minutes. Director Prem had recently thanked all the music composers with whom he had worked in his earlier movies. "If at all people are waiting for the audio from my movie today it is all because those musicians who gave me fantastic songs," the director said. Gurukiran had composed music for Prem's earlier movies like Kariya and Jogi, RP Patnaik in Excuse Me and Ee Preethi Yeke Bhoomi Melide and V Harikrishna in Raaj – The Showman and Jogayya. The songs from Prem's earlier movies were chartbusters. Be it a mass number like 'Hodi Maga' in Jogi or the melodious 'Prem eke' in Excuse Me, the tracks in his films won appreciation from all sections of audience. Sources say that the album comprises of a variety of songs and a few tracks will be released individually before the movie's big music launch, which is likely to be held next month. 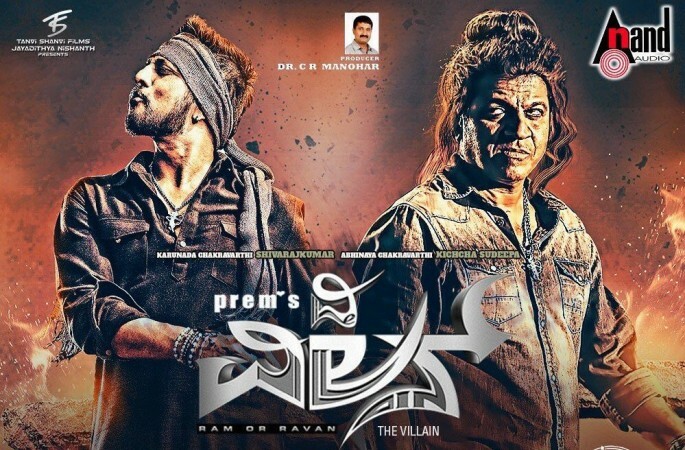 The Villain unites Sandalwood's leading stars Shivaraj Kumar and Sudeep for the first time in lead roles. The movie has Amy Jackson playing the female lead.